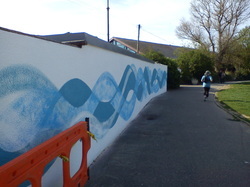 * To create a vibrant sea themed mural for the benefit of the community and visitors to Sidmouth. 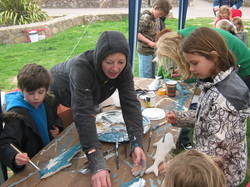 To create a mural on the wall of the Wet Fish Shop, with a seascape background and fish, sea creatures and plants made of tiles painted by children and young people on the 13th April 2011. 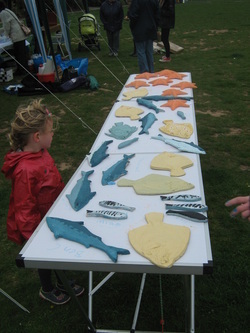 Fish/sea creatures and plants tiles were available for children to paint,(£3 a tile), before they were fired and adhered to the wall onto a base seascape design. 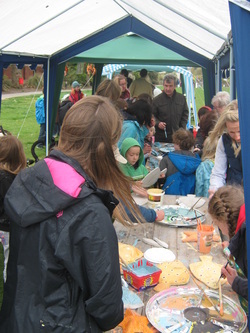 Educational information about sustainable fishing was provided on the day by partners. 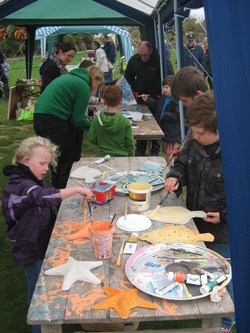 Artist Coco with children creating their fish. Starfish and Plaice coming right up. Fish drying in the wind.